Over the centuries, many singing methods have been developed, focusing on all kinds of genres and aspects of singing. For many singers, however, these methods fall short of addressing some of the most fundamental questions about the basic functions of the voice: How can I reach high notes easier? How can I avoid a sudden change in the quality of my voice? How can I have more power? How can I sing in tune? At IVA, we strive to continually develop our program with the latest research in vocal science to address these and other questions. 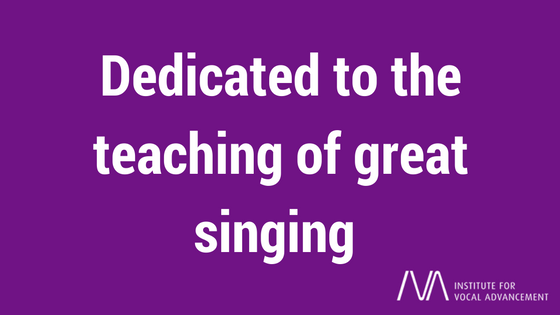 We educate and produce the finest voice instructors in the world who develop, promote, and maintain the highest standards for the teaching of singing. We educate singers with the ability to control their voices in any style of music, allowing the voice to sound free and natural, giving singers access to all dynamics, with tonal clarity and flexibility. We seek to train singers how to use their voices in the healthiest and most efficient way so that singing becomes as easy and as safe as speaking. We help singers to achieve balance in their voices in order to realize their full potential in musically expressing themselves through song.